Plausible PUBG Announce EU Open Qualifier This February! 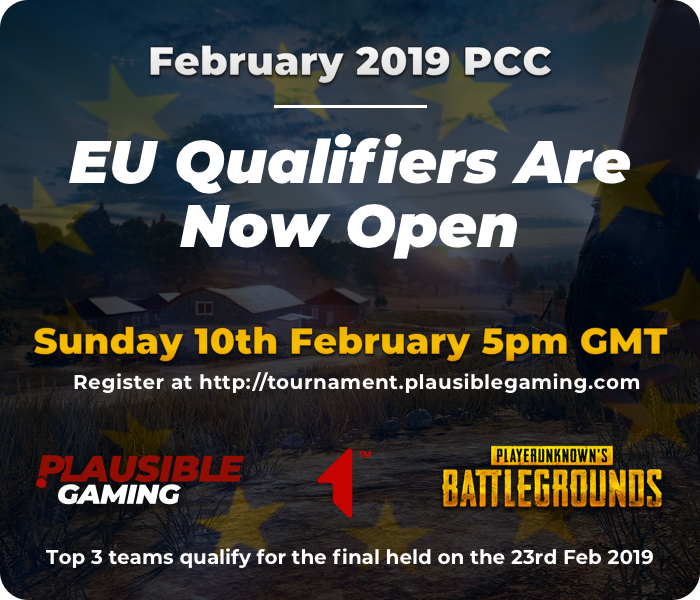 Plausible PUBG has today announced their February PCC EU Qualifier; all of the appropriate details, including dates, times and prizes are outlined below. The EU Qualifier will be held on Sunday 10th February 5:00 PM GMT, if you think you have what it takes you may register your team here. The matches consisting of four-player squads will be live streamed on Plausible PUBG's Twitch channel where four games will be played, two of which on Erangel with the other two matches being played on Miramar. 1st place wins 4 x first blood golden tickets. 1st, 2nd and 3rd place win a guaranteed spot in the final held on the 23rd Feb 2019 where they'll meet the other qualifying teams. Will you be getting involved?